In this talk, Khenpo Sodargye Rinpoche presents us with a good overview of the major aspects and stages of Guru Yoga. Firstly, a clarification is made that Guru Yoga needs to be based on the pursuit of truth rather than on blind faith. Then, important advice is given on how to follow a guru step by step, including when and how to view the guru as the Buddha. 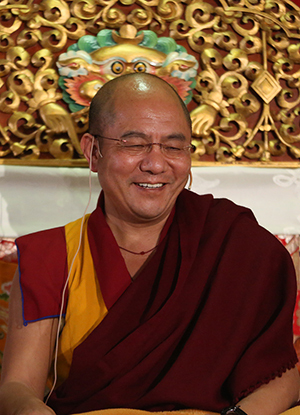 For the advanced layperson Yogi audiences, Khenpo touches upon the power of Vajrayana, and even provides some pith instructions on the nature of the mind through contemplating empty space. Khenpo concludes the talk by highlighting the importance of the Dharma, and urging Tibetan Masters and Buddhists to teach and learn the Dharma. According to Buddhist scriptures, the guru is equivalent to the Buddha, and is actually the real Buddha. However, please note that it is not mentioned that the guru’s body or speech is the real Buddha. In the case of a qualified guru, the merits in the mind of the guru such as wisdom, compassion and power, are the same as those in the mind of Buddhas and Bodhisattvas. The guru’s wisdom mind is no different from the Buddhas’ and Bodhisattvas’ wisdom minds. That is, the guru’s wisdom mind is the Dharmakaya, and in that sense the guru is equivalent to the Buddha. Such is the teaching of all sutras and treatises. We can take certain steps when following a guru. Initially, you do not have to see the guru as the Buddha, and can rather see the guru as a friend. Before listening to the teachings in front of a guru, observe firstly whether the guru has merits or wrong-doings, since such observation in the first place is very important. 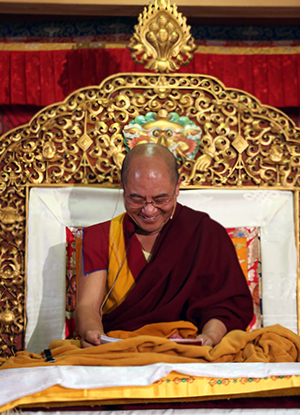 Next, after receiving teachings from the guru, the activities of the guru should be realized as no different from those of Buddhas and Bodhisattvas, and the merits in the guru’s mind are no different from those in Buddhas’ and Bodhisattvas’ minds. At such a point of time, you need to have the firm understanding that the guru is equal to the Buddha. Finally, the merits in guru’s mind—the full and true awareness of the nature of mind, will also be realized by you, and you will thus know that the guru’s mind is no different from your own mind and that at all times the so-called Buddha is nothing but your own mind. When you are fully enlightened about such nature of the mind, you will develop at that point of time a firm understanding and belief that your guru is the real Buddha. From then on, the belief that the guru is the same as the Buddha will be unwavering. Recalling your guru for just one instant. When the mandala of deity was appearing to her, the princess Mandarava was asked to choose between her guru and her deity. She chose the deity. Then, all the wisdom deities in that mandala disappeared, and later Guru Padmasambhava passed all his teachings to Yeshe Tsogyal instead, and Mandarava did not receive any teaching. If any deity such as Manjushri or Avalokitesvara appears to you, and you were asked to choose between your guru and the deity, most people would choose their own deity. However, from the perspective of bestowing blessing, between guru and deity, ultimately guru is more important. When the mandala of deity was appearing to her, the princess Mandarava was asked to choose between her guru and her deity. She chose the deity. Then, all the wisdom deitiesin that mandala disappeared, and later Guru Padmasambhava passed all his teachings to Yeshe Tsogyal instead, and Mandarava did not receive any teaching. Unlike other Dharma practices which require a lot of hard effort in listening, contemplation and meditation for many years, the Vajrayana practice does not have to be particularly painstaking or laborious. It involves some simple mantra chanting, contemplating on the nature of the mind, and meditating in mountain hermitages. And if you have no opportunity to go to the mountain hermitages, then staying at home, and watching your own mind while doing household chores, and at all times, maintaining a unique firm understanding of the true nature of the mind, then that will do. Although such cultivators are not like monks or nuns who have studied broadly many scriptures, and also are not some big scholars, they are never off their own Dharma path, or away from the pith instructions, or apart from the experience of spiritual realization. Then slowly and naturally, the realization of the ultimate truth or the nature of mind will arise in their minds. What is the major reason why the auspicious realization can arise in their mind so easily? Most importantly is the reliance on the teaching of lineage vidyadharas, the blessing power of the highly profound Vajarayana path, and no degradation of samaya between themselves and the guru, plus their own devotion to their guru. When all of these causes and conditions are ready, then indeed, even ordinary people like us can actually attain spiritual realization in our own mind by relying on the highly profound Dharma. You have received before some pith instructions of the nature of mind, and all these can be summarized as leaving the mind in its natural state and recognizing the mind as it is—the mind is inherently luminous. That is all. Letting the mind settle naturally and knowing its true nature, are the teachings in both Dzogchen and the sutras of Prajnaparamita. That is, the essence of the mind is both emptiness and clarity. These two lines are very similar to the views in Dzogchen school. Which though moving is empty. When we gaze directly into the empty space, its nature cannot be found. And if our mind develops discriminating thoughts such as greed, hatred, ignorance or arrogance, we can use our own mind to observe itself. For example, when my greed develops like boiling water, at that moment if I use my own mind to observe my own mind, then the essence of greed is found to be non-existent. Hatred and other discriminative emotions are likewise, and they are actually the nature of the Five Wisdoms. The realization of this is also achieved via the pith instructions from the guru. Guru Yoga is very important in Buddhism. Although generally categorized under Ngöndro or the preliminaries, Guru Yoga from the point of view of actual practice is also part of the formal Vajrayana practice. It clears away the hindrances and obstacles, facilitates the spiritual practice, and is therefore the foundation of all teachings and practices.